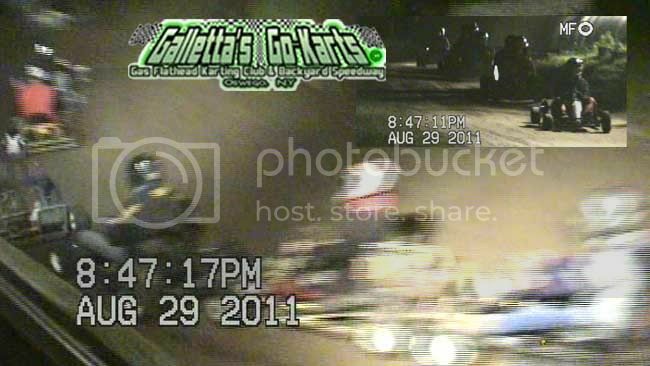 Galletta's Karting Club | August 29th, 2011 - CRAZY Flip during &quot;Don't You Have An Off To F***, Hurricane Irene?&quot; 50-Lapper | Oswego, NY! 8/29/2011: "'Don't You Have an Off to F***, Irene?' 50"! Three returning veteran competitors - Ken Lindsley Jr. (#1), Mike Howell (#6), and Kenny Lindsley III (#0) - were back for this week's race. 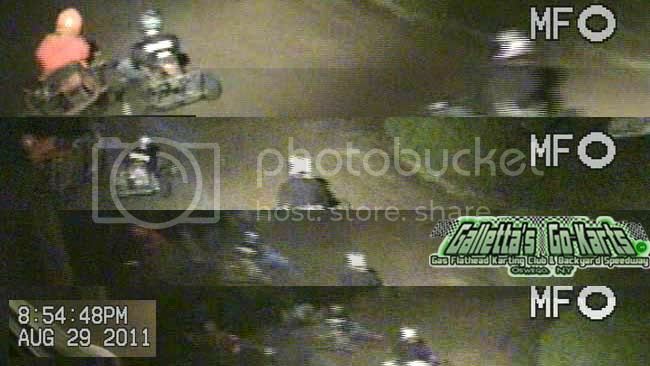 So, in addition to Randy Platt (#187) and Justin Galletta (#7) needing makeup races, we had our biggest retcon race on the year this far. Again, these races are small heats that count points-wise at the end of the earliest feature race that each driver missed. It also serves as experience for inexperienced rookies (none this race) and refresher race for returning vets. 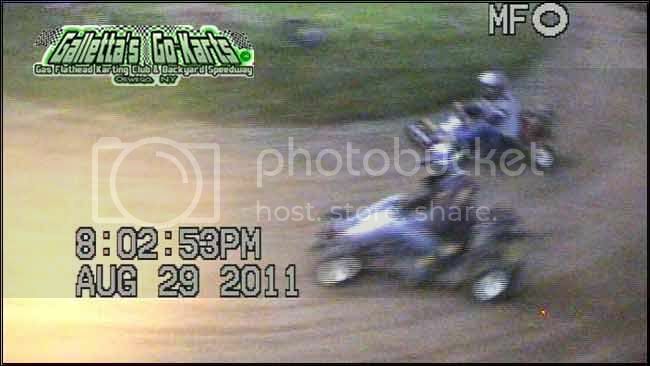 Mike "MC" Howell (#6) and Ken Lindsley Jr. (#1) race for 1st place in the retcon "make-up point" race. Mike Howell (#6) gets Ken Lindsley Jr. (#1) via the fast outside groove during the retcon race. Ken Lindsley Jr. (#1) spins during the retcon race. Matt Stevens (#33) makes his usual low-groove pass move on his wife Melissa Stevens (#19), and Kenny Lindsley III (#0). Joe Sereno (#5) and Justin Galletta (#7) hold off Matt Stevens (#33) in the 1st heat. All three were extremely close in speed, and Matt's usually crafty veteran tricks could not get the pass on the two impressive and constantly improving 1st-season drivers. Heat 2 saw Randy Platt (#187) hold off Chris Stevens (#8) for the win, with Tim Galletta (#54) in striking distance. Ken Lindsley III also took the #0 back out for weight testing (even though he already ran the retcon race and the 1st heat), so we counted it for another make-up race. There was a race he would have made if we didn't have a date change due to weather and attendance issues anyway, so it's a 'sorry about that' deal. Our 10-driver, 50-Lap feature begins! One of the biggest races of the year thus far! 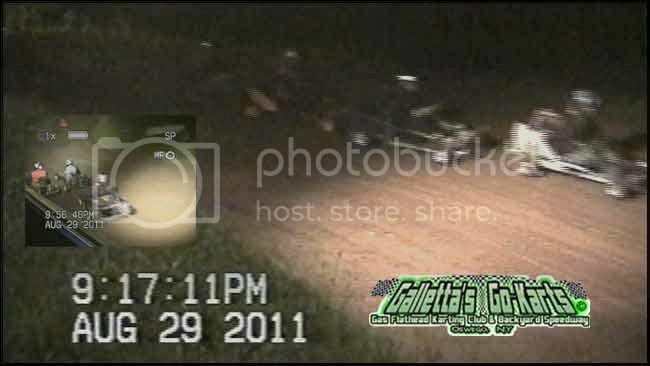 On lap 10, brothers Joe Sereno (#5) and Justin Galletta (#7) got a little out of shape and rubbed tires in turn 4. They raced side-by-side - with Chris Stevens (#8) making it three wide at the finish line until he decided to pull out - down the front stretch and into turn one, when the #7 unintentionally drifted just enough into the #5's line to catch tires, which sent Joe and the #5 wildly flipping off of turn 2, doing his best impression of hurricane Irene! 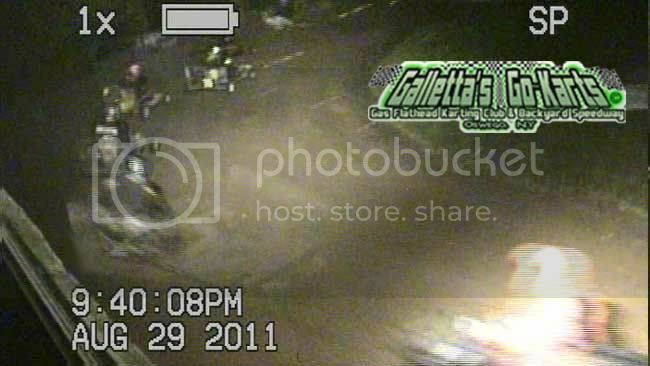 A violent-looking crash to say the least. A nasty wreck for sure. Joe is okay, proving his toughness in the wild ride that snapped the all-metal steering wheel clean off, and bent up the tie-rods. 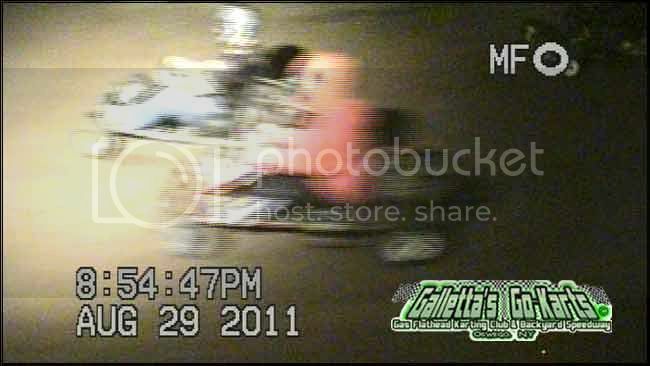 Joe shook it off and hopped into the unused Galletta's Greenhouse #2 kart, which won a feature one week earlier with Randy Platt at the helm. 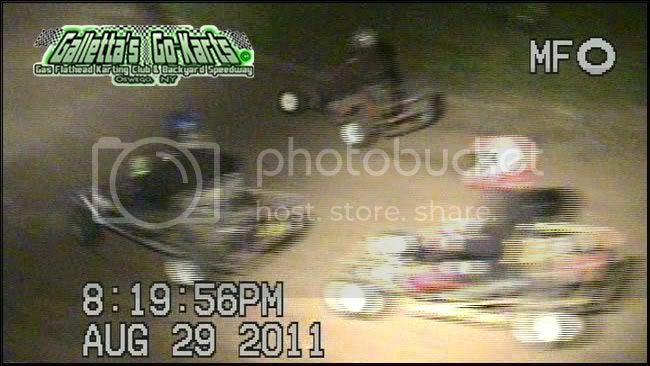 Shortly after that, Chris Stevens (#8) caught Randy Platt (#187) sleeping on a restart. 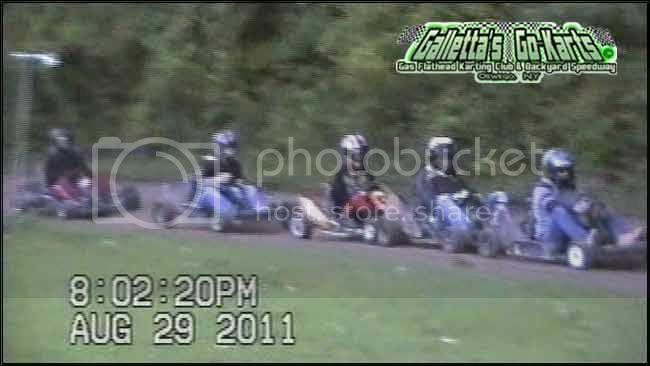 [Inset shows close battles between Tim Galletta, Matt Stevens and Ken Lindsley Jr.] Tim had a little bad luck after his tie-rod nut came loose and bending. 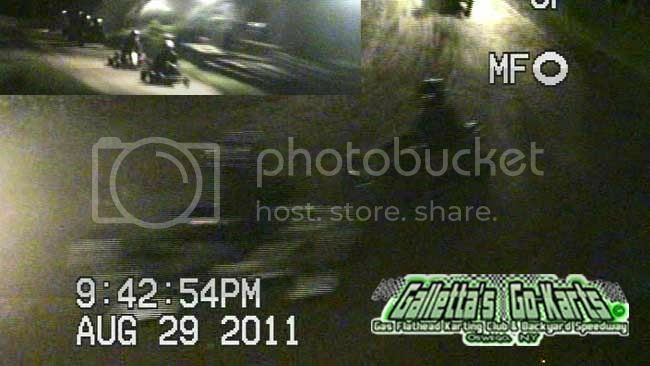 Instead of using a time-out to fix it, he hopped into the unused Galletta's Greenhouse #9, a kart he last drove in the 2009 Galletta's Klassic 200. Yep. That's how close we were for most of the night. The track was decent other than a couple bumps developing in 2 and 3, and other than Randy and Chris crawling away in their battle for the lead, everyone else were bumper-to-bumper all night. Head-mechanic Matt really has these machines close and fast right now. And trust me, he takes more pride in seeing a close race than he does winning. 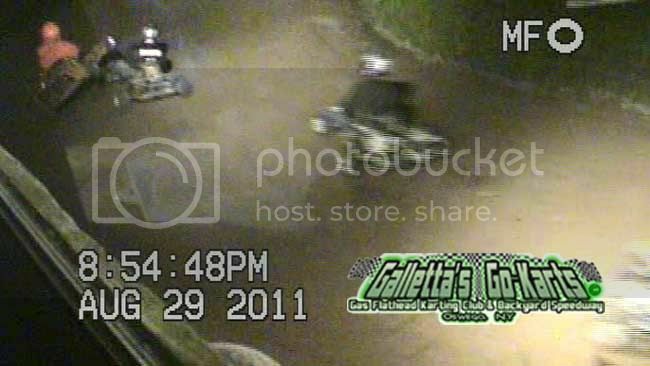 Which makes it even scarier when he does pull off a bunch of wins in a row when these karts are so close. 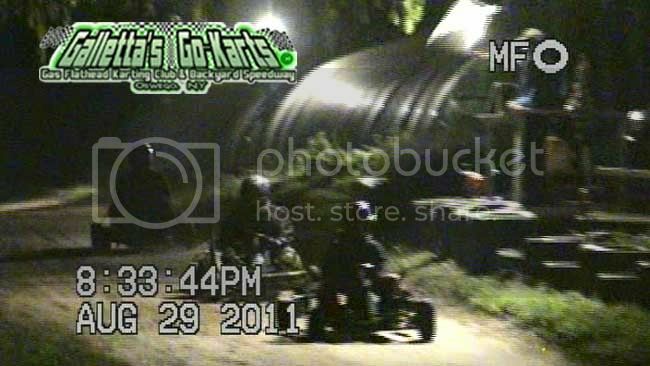 It shows his experience and craftiness behind these karts. 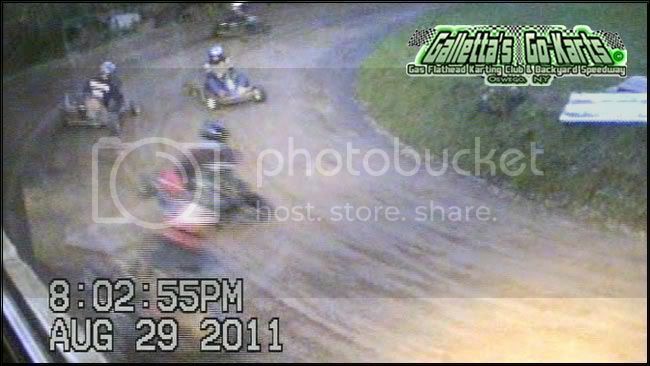 And yours truly oughtta' know, I've been racing against him since the early 1990s, and 2nd only to him in races, points and wins of all Oswego County karting leagues since then. Chris held off Randy 'Bobandi' Platt for the rest of the show for only his 2nd win of the season, surpassing his 1-win total from last season (although he still eked Matt out by 1/2 point for the points title last year). 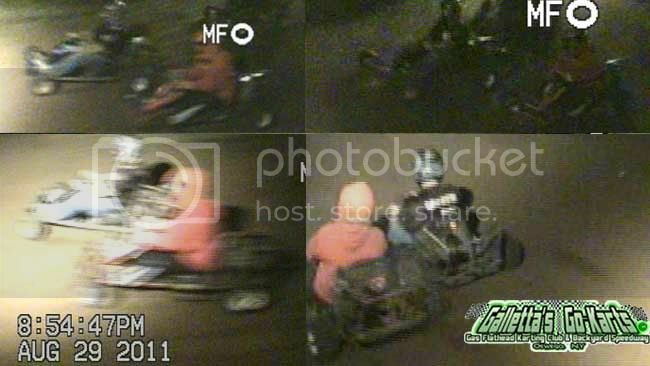 But Chris and Randy were the same exact speed, as neither could pull away for the other all night, and if not for Chris catching Randy snoozing on a restart, Ran-the-man would've had 2 wins in 2 weeks. Next race should be Monday, Labor Day, unless weather shuffles things around. 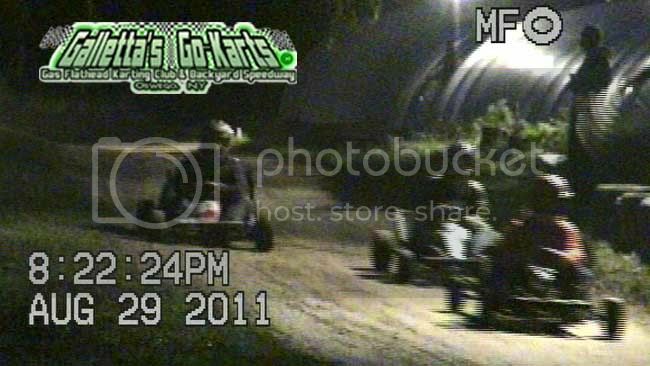 Matt uncharacteristically struggled for most of the night, getting in a handful of wrecks and stalling/parking his two usually dependable karts - the #3 and #33. 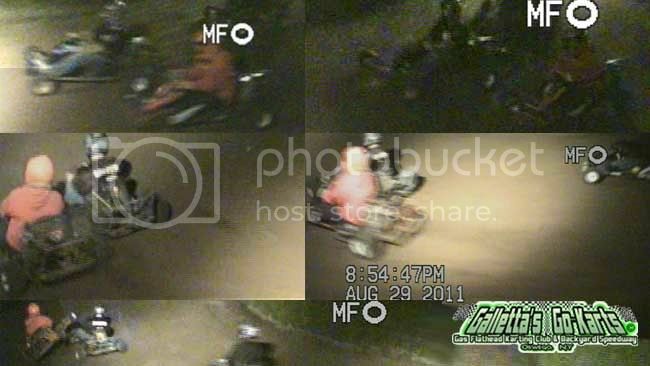 He wound up finishing the race in his wife's backup, the #80. Not a good night for Matt, who usually is either winning or challenging for wins every single night. However, again, this proves the theory that if enough solid veteran drivers are out there, Matt doesn't find victory lane so easy to get to. You think you're a bad driver, then come out and try to hold off Matt and see how bad you are (and 30-40 lap short track "Championships" prove nothing). It got done this week (holding Matt back that is), but rest assured, when Matt struggles one week, the next week he is usually on fire. Get ready, drivers! 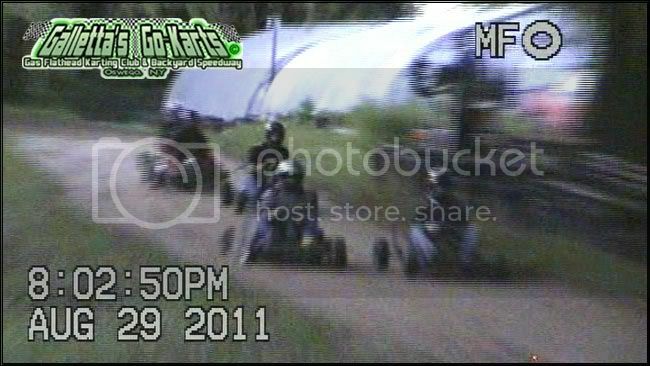 SPECIAL SHOUT-OUT TO THE DOZEN-OR-SO LOCAL KART TRACK MINI-CLASSIC WINNERS THIS THURSDAY, SEPTEMBER 1st, 2011! WHEW! Busy week of work, car repairs, NY State Fair, lack of sleep, running errands, and a complex race where 10 competitors raced, along with no less than FIVE that entered Rectcon make-up races (hard because I have to go back and score each driver in the earliest race they missed) meant that it took me five days to get these points finished. Sometimes I make too much work for myself, but I want as competitive of a point system as humanly possible. I think we got that (look at the points, wins, and points-per-races... really close, and closer than most races). So do enjoy them! For the Galletta's Karting Club's World Championship of 1WD Gas Flatheads held on Galletta's Greenhouse Backyard Karting Speedway for the 2011 season to date. 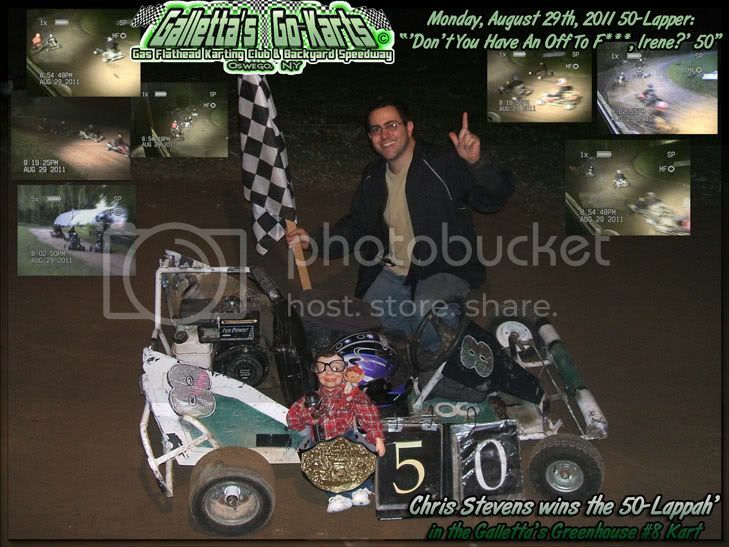 Our complete All-Time Points Standings from 2000-to-'the-last-completed-season' are found on this webpage, our complete 2006-08 standings on Oswego Speedway's Kartway on this page, and our 2000-to-'the-last-completed-season' wins are on this page. At season's end, the current totals will be added into the below.